Fort Collins, Colorado: Between A Scene And A Hard Place : The Record When you're big enough to nurture great bands but not big enough to hold onto them, what's a town to do? A poster for last year's FoCoMX. Pinned to the foothills of the Rocky Mountains by the East-stretching plains of Middle-America, Fort Collins, Colorado is a land stuck between two extremes. This university town is big enough for an assortment of music collectives to bloom, but perhaps not big enough to hold them. Fort Collins is home to the revered recording studio The Blasting Room and members of punk rock legends The Descendants, All, and Black Flag have ties to this town. These bands made names for themselves outside of the city. 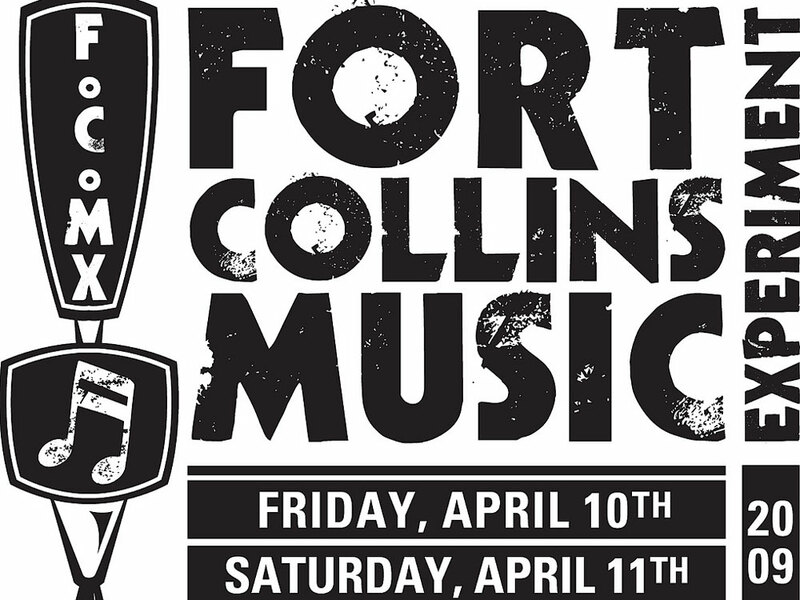 Now a non profit organization called the Fort Collins Musician's Association (FoCoMA) is working to make the city a place where musicians can stay, and they're doing it by exposing the scene to itself. Jon Alonzo is the manager and former member of the band Candy Claws, one of the most successful bands to come out of Fort Collins, and the founder of Act So Big Forest, a musician's collective in the city. He says that FoCoMA started as a very small group of intensely driven musicians, who wanted to address the many needs of local musicians. "They were booking shows, and doing educational forums, basically to provide young musicians with a ticket into the music scene, and provide music lovers with easy access to music," he explains. "Then Greta wanted to start doing this music festival, and we were like you're crazy." "Greta" is Greta Cornett, the president of FoCoMA and the founder of The Fort Collins Music eXperiment, (FoCoMX), a young but growing music festival that launched in 2009 to spotlight music in Northern Colorado. "We feature as many of our local bands as we possibly can," Cornett says, "and we work with a lot of venues, and places that aren't venues, to get live music in there." The concept seems simple but the first festival stunned many in the community by exposing the far reaching corners of Fort Collins' sound. The festival included performances from Otem Rellik (rapper Toby Hendricks), Sterile Garden (local noise-guru Jacob DeRaddt), the Good Old Fashioned Sinners, and a handful of other locals. "First year, smash hit. It was amazing," says Alonzo. "It was kind of trying to make the local scene know about the local scene. To be honest, I had no idea what was going on until the first festival. I was blown away." The festival's success gave the event the momentum it needed to for an even bigger turnout this past April: the 2010 festival featured 189 bands -- all from northern Colorado -- playing in 22 venues and supported by 29 sponsors. Impressive considering Fort Collins is a town of only 130,000 people, an audience base that many musicians find restricting. Matthew Sage runs the local record label Patient Sounds, and is a member of the local noise band M. Pyres. He says that he is conflicted about staying in Fort Collins. "I am torn about playing in Fort Collins, to be honest. It is still a very small community, and generally, if you play a show here, you are going to be playing to about 20 of your close friends, and then maybe 15 strangers/college kids/party-dudes who aren't really there for your set," he says. "Playing to a new crowd here is challenging, if not practically impossible. This makes for lots of trips to Denver for shows." "One big thing we always do is give a pass to all Colorado bands for the whole weekend, so that they can come up and see what's going on." She feels that this helps to fuel the camaraderie that exists between artists in this town. "It's really cool to see so many of our musicians out supporting each other, which is one of the unique things about the Fort Collins scene in general -- is that musicians are very supportive of other musicians." "Not to say that everyone gets along, or that we have some Utopian set-up here, but there is a general sense of a communal dwelling here," he says. "We aren't East-Coast. We aren't West-Coast. We are mountain people. We are wild, it's our nature, and I feel the wildness has added to our collective mode of making music."